improvements as well as having the benefits of competitive cost per part production. Excellent electrolyte quality ensures constant gap conditions for improved quality and superior process stability. 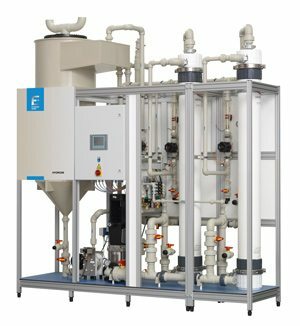 – Reduce disposal costs on filter cake by 10% (HYDROM in combination with CFP-Chamber Filter Press). – Reduce CFP cleaning time by up to 6x. – Extended cathode tool life. HYDROM delivers constant electrolyte quality, even when proceeding to the CFP cleaning operation. Modular unit (3000 – 9000 L/H) is adaptable and will meet all of your requirements with increased capacity for additional membranes.